It’s the start of another busy semester of grad school. I kind of overextended myself with the amount of workload I took on, so I’m taking a few weeks to get my bearings. Jeanne’s (Inside NanaBread’s Head) package could not have come at a better time! 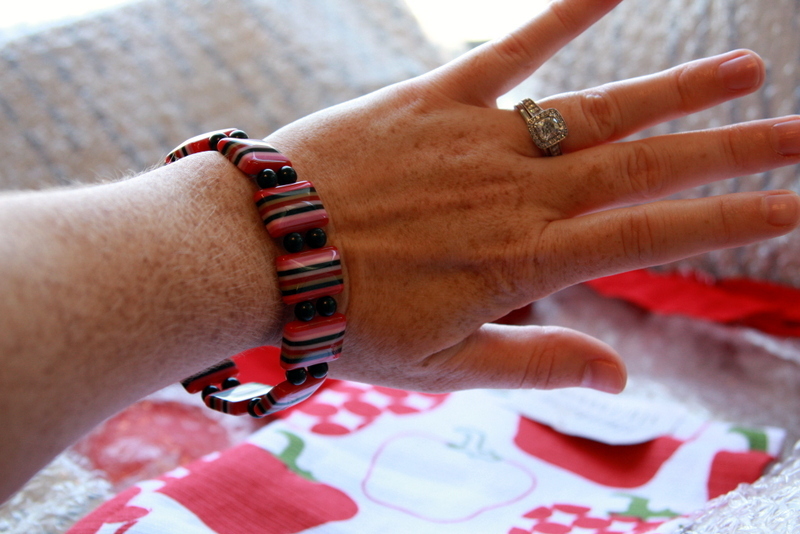 For those of you who don’t know what I’m talking about, my bloggy friends joined together to send semimonthly care packages to one another in a segment called: One Kitchen Many Hearts. 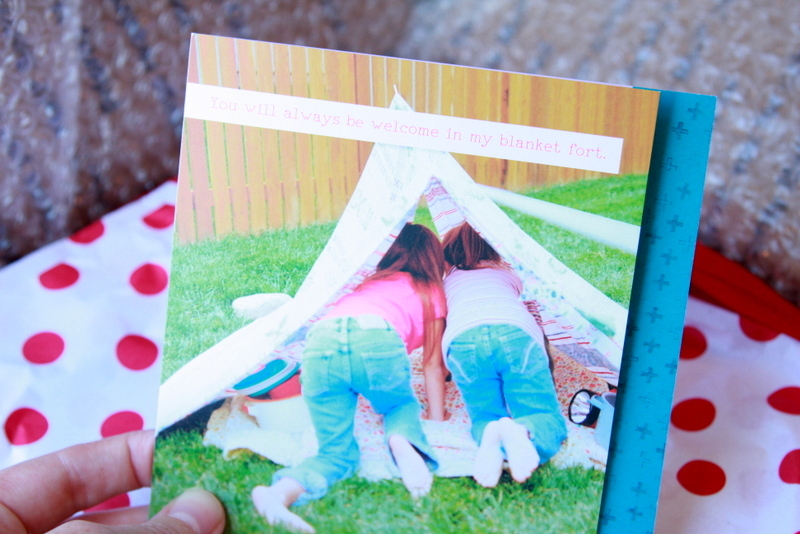 “You will always be welcome in my blanket fort.” Too cute! It helps us stay connected to each other and to give treats from our respective regions of the U.S.. I learned it is extremely difficult to take pictures of your new bracelet in good lighting, one-handed, and while trying not to accentuate your arm hair at the same time. I am always amazed at Jeanne’s uncanny ability to know what my favorite things are, without ever discussing these things in person. I mean, a bright red silicone spatula? Come on! Brilliant! 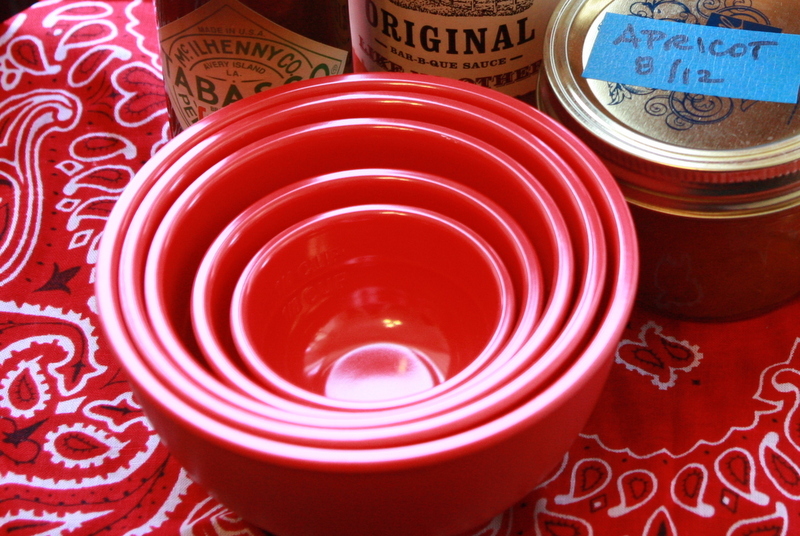 …nesting bowls that are also measuring cups! A few months ago I asked Jeanne where to get Chipotle Tabasco, sure enough, it shows up in my next care package. She’s incredible. Thanks so much for the Texas love! I couldn’t have needed it more right now. 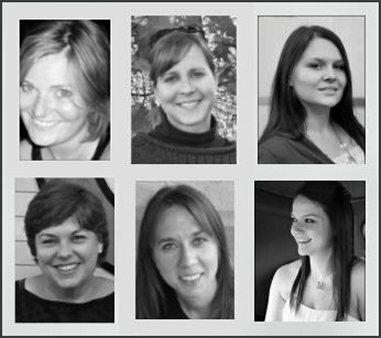 Me, Kirsten, Megan, Jeanne, Allison, and Kat. This entry was posted in One Kitchen Many Hearts by Mads. Bookmark the permalink. 1. Chipotle Tabasco stirred into ketchup for your fries – fuhgedduhboudit! 2. The apricot preserves are awesome on baked brie, or stuffed with cream cheese into wonton wrappers and deep fried (tossed with cinnamon sugar for dessert or served with a sweet hot chili sauce as an appetizer). I know, right?!? 3. 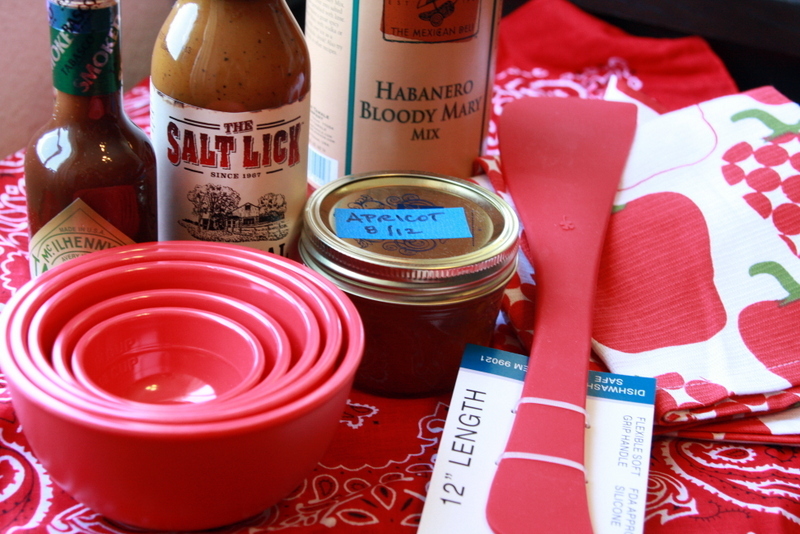 Salt Lick BBQ Sauce – my favorite use is on a smoked pork tenderloin. Seriously good. PS – How was the bloody mary mix? Do I need to grab one for myself (I mean other friends)? Well thank goodness for the bloody mary mix–sounds like you need one before heading to class. 😉 Love the box of red, Red! That blood Mary mix sounds divine. We’ll need to have a good supply of that at The Compound. Also, you totally hit the nail on the head – we live hundreds of miles away from each other yet everyone knows everyone almost too perfectly. Jeanne forgot to mention that preserves are also tasty spooned right out the jar. So I’ve heard. Jeanne just Knows Things. That’s what I’ve come to determine, anyway. If you want to save that apricot jam until you come home to visit, I would happily eat that baked brie with you. 🙂 Or in wonton wrappers or as dessert. Or really, I just miss you Mads. Tons and tons. Even though we talk mostly every day. Happy Friday.